The Magnolia Joglos are without a doubt, one of the places to stay before you die. In fact, it is such a heavenly place, that you will probably think you did die and go to Heaven. At least I did!! The Magnolia Joglos consist of a few Javanese open-air style joglos set in the middle of a rice field in Penestanan, an artist’s village, that is part of Ubud . I stayed in the Passiflora one, and the minute I got there, I felt an extreme sense of peace settle in my being, the weight of the world being lifted from my shoulders, and knew that all of the yoga that I planned, all of the classes, and all of the activity wouldn’t be happening on this trip. I just wanted to sit and watch the rice grow. Every detail here is thought of, every care or concern that you could have is looked after. My favorite feature was the outdoor soaking tub and shower. 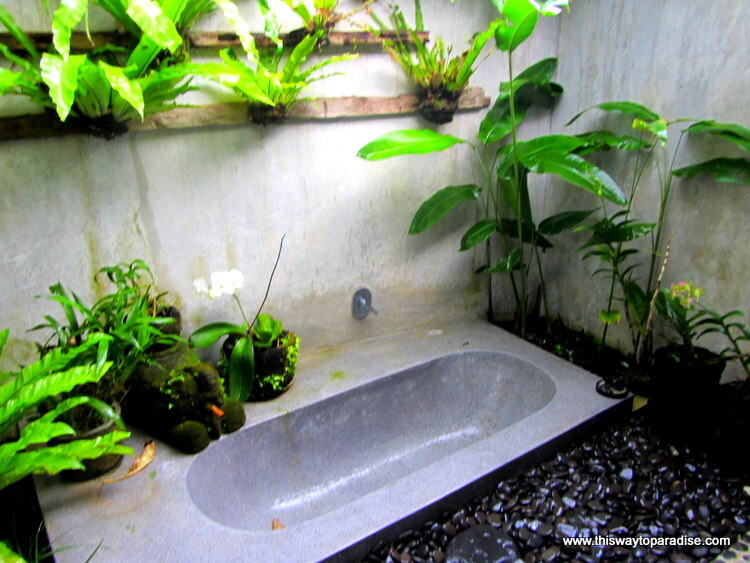 There was nothing like bathing and showering under the stars in the beautiful garden setting. I was overtaken with joy when the first morning, a coconut delivery man came by and cut open coconuts for us to sip the refreshing hydrating coconut water from. I quickly arranged delivery for the remaining days that we would be staying. I also loved having Made come and make us breakfast every morning. The breakfast consisted of some of the best coffee that I’ve ever had grown nearby, homemade yogurt which made me feel like I’ve never tasted yogurt before, and delicious tropical fruit like mangosteen, snake fruit, and papaya. I also enjoyed the lovely walk into the town center of Ubud. The walk along tropical flowers and foliage and among the rice fields was one of my favorite walks. With it’s butterflies, fireflies, and frogs, it was a nice contrast to the heavy traffic in town. But my favorite part of the stay was Alejandra, the owner of the houses. She gave us great advice about hidden things to do in Ubud, where the best restaurants were, and the places that we shouldn’t miss. Her hospitality was really the icing on the cake. 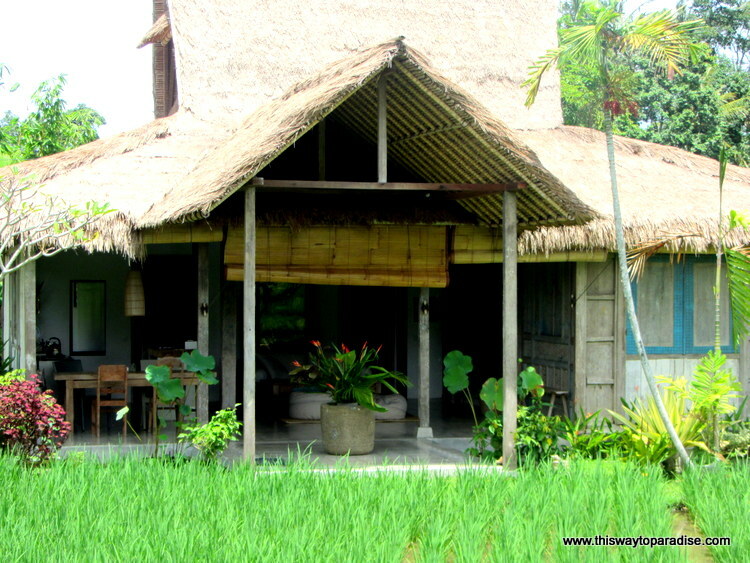 If you are looking for places to stay in Ubud, look no farther. Having Valerie and Heather come and stay was like having your favorite friends over a for a slumber party you don’t want to have end and I didn’t even know them! I loved their enthusiasm about everything and I’m an instant BIG FAN of This Way To Paradise (and I live in paradise). It’s the cat’s meow that I get to be included in the awesome places she discovers!!! I can’t wait to hear about Lombok so i can be a copy cat!!! Have a great trip Valerie!!! I hope this mail will reach you. I just saw your very beautiful place in Bali and would love to book 3 weeks in April 2018. As this is so much in advance…I feel a bit insecure booking over airbnbn. Looks and sounds amazing!!! We plan on spending a full 30 days (visa worth) in Indonesia in May 2014! Writing this one down! I recommend getting your visa ahead of time and getting the 60-day one. You will breeze through the airport. There is so much to see in Indonesia. And Alejandra gives a discount if you stay for a month at her place. You will love it! !